At three, Juana Ines de la Cruz, feisty Mexican girl with a sustaining passion for knowledge, persuaded an older sister to teach her to read and write. Juana devoured the books she found in her grandfather’s study: literature, science, philosophy, theology, languages. She developed some quirky habits. “I would abstain from eating cheese because I heard tell that it made people stupid,” Juana reports, “and the desire to learn was stronger for me than the desire to eat.” Whenever she was dissatisfied with her mastery of a certain subject, she’d cut off her hair to punish her own dull-wittedness. A head that was bare of facts should also be bare of pretty curls. Given her astounding intellectual discipline and drive, Juana’s future as an academic was surely guaranteed. Ah, but wait. The era was seventeenth-century Mexico. The authorities were male, traditional Catholic, Spanish colonialists. And the young scholar? She was the daughter of unwed parents, a Spanish military officer and a Mexican-born mother, a girl from the town of Nepantla, Aztec for “land in the middle.” As an illegitimate child, her birth was not even recorded in the church registry. Her very existence was off the books—but not for long. Once Juana finished off her grandfather’s entire library, the next thing our preteen prodigy had to do was get herself out of Nepantla and find a way to Mexico City, center of her universe. At thirteen she was presented as a lady-in-waiting to the court of the viceroy and vicereine, the sovereigns of Spain who ruled the New World colony. The royal couple happened to love literature, a lucky break for the new girl who knew that flattery will get you everywhere. Juana composed a series of romantic poems that starred the vicereine herself, a promising start to her literary career. The viceroy saw opportunity for amusement in his wife’s dazzling young companion. He rounded up the forty finest mathematicians, philosophers, historians and theologians for an intellectual showdown. The men quizzed and questioned the girl in a seventeenth-century Battle of the Brains. Confident in her vast knowledge, Juana outwitted and charmed them all. So what would be her next move? More than anything, Juana wanted to live in solitude with the freedom to study undisturbed, to pursue “beauties with which to stock the mind.” The royal court’s endless rounds of balls, gallantries, and entertainments were a distraction. After the current viceroy’s term was up, Juana might not get to stay on as lady-in-waiting anyway. With sketchy family credentials and no dowry money, respectable marriage was not for her. Juana was left with only one legitimate path: to become a nun. These days, when only 1,200 young women across the United States are preparing to join Catholic religious orders, it’s rare to meet a nun, let alone know a young woman who sees the cloister as a career destination. Things were different back in colonial-era Mexico, when convents were a huge social and economic presence. There were sixteen convents in Mexico City in 1650, filled with the daughters of society. Though nuns remained under the authority of male clergy, the cloisters were self-contained feminine worlds combining the spiritual life and honorable vocation. No wonder our young scholar found it the “least unfitting” option. What was not to like about the Convent of San Jeromino? Sor Juana Ines found much of the independence and tranquility she needed to cultivate her “inclination to study.” Her own comfy corner cell had two floors; her second-story window featured a view of the Valley of Mexico. There she built up her own personal collection of books (both secular and sacred), works of art, and a variety of musical and scientific instruments. Over time, Juana Ines amassed the largest library in all of Mexico, right there in her convent rooms. 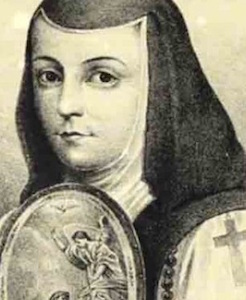 During her years as a nun of the Convent of San Jeromino, Juana Ines de la Cruz wrote widely: religious and secular plays, verses for dance tunes, sacred poems, love poems, comedies, philosophy, an essay in theology, even an autobiographical defense of the right of women to study. Her works were published and performed. Juana was renowned as the most erudite woman in Mexico before she was even twenty years old. As a cloistered woman, she was never permitted to leave the convent—ever. But the world came to her. Juana corresponded with learned persons across the Spanish dominions and Europe. Visitors, from intellectuals to courtly socialites, came to her locutory. Juana’s parlor became a kind of literary and intellectual salon where she taught seminars, read her poetry and plays, and discussed ideas. You haven’t heard of Sor Juana Ines de la Cruz? You can blame it on centuries of storytellers, the ones who’ve recounted the intellectual traditions of men and ignored the silent and silenced contributions of women. Your ignorance is no surprise. Even in her own day, Juana’s bold public voice was hushed by bishops and priests. It’s been 350 years since she lived, but it’s not too late to bring Juana back. Her words have been here all along. And what was the nature of Juana’s personal life with God, her deeper devotion to Christ? Some dismiss the role of belief in Juana’s experience, assuming that she joined the convent purely as a profession. Never did Juana demonstrate excessive piety, notes one biographer. Alongside the fervent nuns of her day, those who composed flowery mystical writing or inflicted harsh self-mortification, Juana was hardly the conventionally submissive sister. This is hardly surprising, for Juana was always an independent, atypical woman. Why would she express her faith in a typical way? Juana’s deep commitment to God is enfolded in her philosophical writings, her submission to communal life, and within vivid creative writings intended for the wider world. Juana Ines gave away all of her beloved books, treasures, and scientific instruments. Why? Did she submit to pressure from church authorities, the men who were severely critical of her growing renown? Did she experience some kind of conversion, a new call from God? One scholar suggests that, disillusioned, Juana renounced worldly human studies to enter the hushed world of contemplation and charity. Another sees this as a temporary period of intense spiritual devotion promising renewed intellectual work to come. We will never know, for two years after the renunciation of all that she loved, Juana died from an illness while caring for the sick in her own convent. What, then, do I make of my own gifts, my own desires, in light of Juana’s sad end? Does God want what I want—or does admitting to my hopes put me in peril of seeing them crushed? Am I permitted to even have desires for myself? I’ve known the love of learning, Juana’s “natural impulse which God implanted in me.” Unlike her, I’ve had the privilege of attending college and even graduate school (dressed as a woman, no less). Unimpeded, I have indulged my appetite for cheddar cheese and preference for long hair. I’m surrounded by more books than I could ever finish. After years of sketching outlines during stolen hours, I’m writing this very book. Not until now, though, have I dared to claim it. I am a writer. In my mind, the old dark warning remains below the surface: the Christian life is not about following your own desires. It’s about giving up the things you want. Be prepared for renunciation. Even as I name my vocation, I back down, lose confidence. Life is full of pressing obligations to be met. By the time I take care of the people who need me and the day’s ordinary demands, can I hope that there will be anything left of me? Tales of saintly, suffering martyrs inspire fear and tumult in my heart. Clarity comes through the words of Scripture. There Jesus speaks a deeper, more beautiful truth. “The thief comes only to steal, slaughter, and destroy,” he promises. “I’ve come that they may have life, and have it abundantly” (John 10:10). No, it isn’t Jesus who destroys good things. It wasn’t God who consigned a twelve-year-old to torment, who stripped Juana of her books or infected her with the plague. Gifts are denied by the thieving power of sin and death, and that’s a power that has already been defeated. Karen Wright Marsh is the executive director of Theological Horizons in Charlottesville, Virginia. She is the author of Vintage Saints and Sinners: 25 Christians Who Transformed My Faith (InterVarsity Press, 2017).